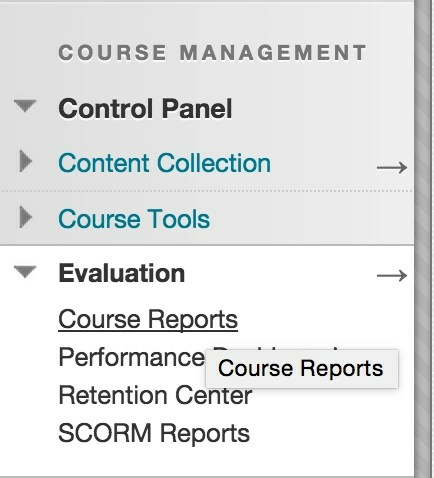 Blackboard provides 9 different reporting options that allow instructors to view analytics for a variety of course activities. Reports range from an All User activity view to an individual student’s activity. This report displays a summary of all user activity inside Content Areas for the course. Course Activity Overview displays overall activity within a single course, sorted by student and date. Data includes the total and average time spent per user and the total amount of activity the user had in the course. This report displays goals coverage information for a single Blackboard Learn course. Data includes both covered and gap values for all curricular areas that the course is associated with, as well as a breakdown of course items that have been aligned to goals. This report displays information showing how a single Blackboard Learn Course performs against a selected set of goals. Performance targets and a range of acceptable performance for the course can be determined when running the report. Data includes averages for the entire course as well as break downs for individual students and goals. The report displays user activity for all areas of the course, as well as activity dates, times and days of the week. Student Overview for Single Course displays an individual student’s activity within a course, sorted by date. Data includes the total overall time the student spent in the course as well as detailed information about the student’s activity, such as which items and Content Areas the student accessed and the time spent on each. This report displays a summary of user activity in Discussion Board Forums for the course. This report displays a summary of user activity in Groups for the course. From the Course Reports page, find your requested report. Click the Chevron icon ( ) then click Run. Tip: To select all users use CTRL + A on Windows or ⌘ + A on a Mac. To select multiple users hold down the CTRL button, then click each student’s name. Repeat the process for a Mac using the ⌘ key. Once the report has been processed it will open in a new window.